These Smoky Sweet Potato Fries are awesome. I used to think that french fries were off limits once I started eating better, but it turns out that’s not the case. I already have a Healthy French Fry recipe on the blog. I love sweet potatoes and I really wanted to make some french fries with them. Well today I made these sweet potato french fries, and they were amazing! 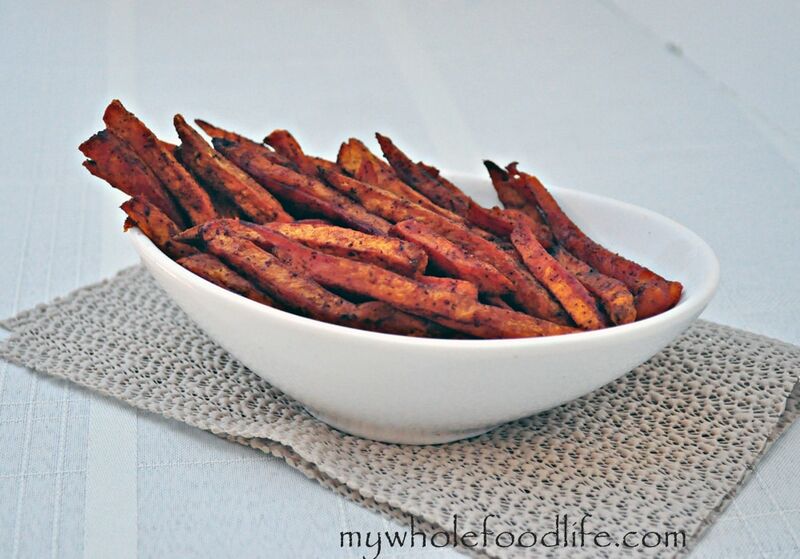 This sweet potato french fry recipe is really simple to make. The smoky flavor of the chili powder and the smoked paprika really goes well with the sweetness of the sweet potatoes. This recipe would go great with my veggie burgers. I loved dipping them into my Homemade Ketchup. Needless to say, the entire tray was gone in minutes. My picky, older daughter loved them! This made me very happy because she says she doesn’t like sweet potatoes. In a saute pan , pan sear the fries with the oil and spices for about 5-7 minutes, stirring often. Once all the fries are well coated with seasoning and oil, spread them out on a lined baking sheet . Bake for 1 hour, stopping halfway to flip and shake them around. That’s it! These should last a week or so in the fridge. If you can keep them that long! I love using smoked paprika! I haven't tried it with sweet potatoes yet and these sound wonderful!!! Thank you! They are the bomb with the smoked paprika. I hope you enjoy them as much as I do! Not sure if my fries were cut smaller than your (I used my mandolin) but my fries were nearly burnt after 30 minutes in the oven. They definitely have potential though. I will try again and lower my cook times. Also, what temperature are you frying at? I was at medium high and it seemed to burn some of my spices. Fun looking sweet potato fries! Thank you. They are so good! Made these sweet potatoe fries tonight and my husband and I LOVED them. I forgot to use salt but they didn't need it. Curious, did you peel the sweet potatoes first? We did, but you could also leave the peels on. These were so good, hard to believe they are healthy, haha! These were delish!! Thank you so much for the recipe. I've made sweet potato fries before, and these turned out the best by far. You are so welcome! Glad you enjoyed them! I am so happy to see this recipe. I have read that the sweet potato is a "super food" and it is not a potato, it is a root vegetable., this just fascinates me. Thank you, I will give this recipe a try. You're welcome Laura! I hope you enjoy the soup.